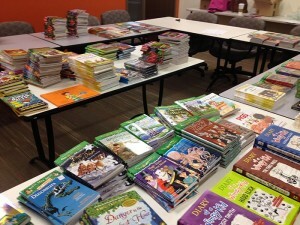 Getting books into the hands and home of young children is one of the goals of Bruton’s Books. During the summer it is even more important so kids can keep up their reading, and not suffer what many call the summer brain drain. 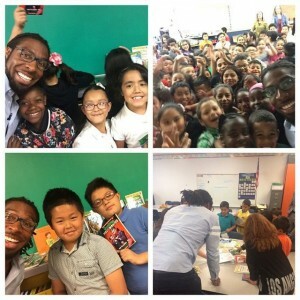 That’s why last May, David Bruton Jr. delivered hundreds of books to four schools: Kenton Elementary and Crawford in Aurora and Columbine Elementary and Greenlee Elementary in Denver. Through our partnership with Mile High United Way, Bruton’s Books has adopted these four schools where they also provide reading support through the Mile High United Way Colorado Reading Corps and Power Lunch programs. Throughout the year, David will make several visits with books in tow, to help spread the love of reading that he enjoyed as a child and provide books to those families who may not have the means to purchase books of their own. 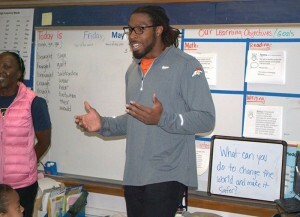 David loves to share his love of reading with the students and when one of the Captains of the Denver Broncos tells you how cool it is to read all the time then it IS cool! David spent time with the third graders at each school delivering his message of how important reading is to their success in school and in life. He asked one class at Crawford Elementary what career they could have if they could not read and then explained how each profession needed reading skills. One young boy challenged David about football, “did football players need to read”? David walked him through his typical day at the UCHealth Training Facility and each instance where he needed to read. Score another point for the Denver Broncos Player! One class of third graders at Kenton Elementary wrote individual contracts for David, promising to read every day during the summer. 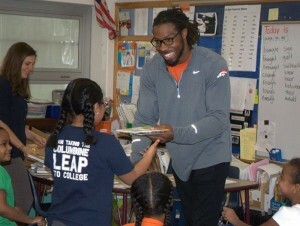 At Greenlee Elementary and Columbine Elementary, both DPS schools, David delivered the books while the Mile High United Way Power Lunch volunteer reading buddies helped their students pick out the books suitable for their reading level. All the kids were so excited to receive books to keep over the summer and continue to improve their reading skills, and of course see David. Many students often do not have access to books once the school year ends for many reasons, and this is just one way, David Bruton Jr. , Bruton’s Books and Mile High United Way are helping our community’s children avoid summer learning loss, foster a love of reading and become strong, confident students.